This page provides you with useful information and PathFinder-XD software debugger downloads for use with Ashling’s Opella-XD for MIPS debug tool supporting Imagination Technologies MIPS Processor Cores. Please contact our Technical Support team if you need help on Ashling hardware or software tools. 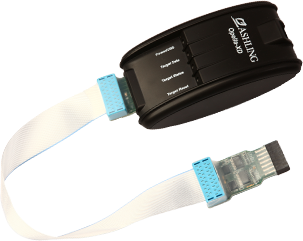 This document (APB207) introduces Ashling’s PathFinder-XD for MIPS™ Debugger working with the Ashling Opella-XD Debug Probe. It also demonstrates PathFinder-XD’s Embedded Linux debug support using Opella-XD connected to a Ubiquiti Networks RouterStation Pro (powered by an Atheros AR7161 MIPS24K based SoC) target. This document (APB211) introduces Ashling’s PathFinder-XD for MIPS™ Debugger working with the QEMU MIPS core simulator. It also demonstrates PathFinder-XD’s Embedded Linux debug support. This document (APB213) introduces Ashling’s PathFinder-XD for MIPS™ Debugger working with Broadcom BMIPS5000 devices which support On-chip Trace (Zephyr) such as the BCM742xx family. Includes Embedded Linux debugging support for Connect 20 Software Development Platform (powered by a Broadcom BCM7420 dual-threaded 750MHz MIPS based SoC). Before downloading PathFinder-XD, please note you will need administration priviledges to install PathFinder-XD; additionally all PathFinder-XD users require full access to the PathFinder-XD installation directory at all times. Complete this form to request your software update service Account Password.